Not everyone is pleased with Bank of America’s record-setting $8.68 billion settlement of lawsuits against Countrywide by attorneys general across the country (see previous post here). Under the agreement, BofA, which acquired Countrywide in July of this year, agreed to modify up to 400,000 mortgages by refinancing loans, lowering interest rates and reducing principal amounts, in what the bank described as a win for investors, borrowers and the mortgage market as a whole. 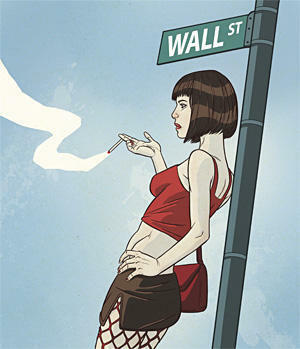 In reading about this potential lawsuit, I recalled a recent article that appeared in the Village Voice depicting Lehman Brothers’ loan origination and servicing subsidiary, Aurora Loan Services, as the sleazy streetwalker of Wall St. (see picture above right). The article highlighted a number of instances in which Aurora took a hard line and attempted to foist foreclosure upon borrowers who missed payments but were still ready and able to pay. At the time, I assumed that Aurora’s actions were driven by investor pressure, since Aurora no longer owned most of these loans, but merely serviced them on behalf of large securitizations. But why in the world would investors object to workouts or modifications that enabled borrowers to remain in their homes and continue making payments on the loans? It seemed to me that the costs associated with foreclosure, combined with the soft housing market, would likely impose a greater overall loss on investors than a workout structured so that borrowers continued to make reasonable payments into the securitization. Were investors simply hoping servicers would liquidate these mortgages in a short-sighted attempt to recover whatever money they could on their greatly depressed investments? A Wall Street Journal report last week on the potential challenge to the BofA settlement helped to shed some light on this question. The Journal notes that several investors it interviewed indicated that loan modifications, if done properly, could benefit investors. However, it points out that some investors believe that many of the loans at issue violated the representations and warranties made by the lender when the loans were packaged into securities. As a result, these investors believed these loans should be repurchased by BofA rather than modified. Ah, now things are becoming a little clearer. So, investors are not hoping for foreclosure, as most realize this would be the costliest route. Instead, they are hoping that BofA and other lenders will foot the bill for repurchasing entire mortgages due to breaches of reps and warranties. In our representation of a mortgage insurer, we have seen that such breaches, including defects like improper underwriting, fraud or negligence in the origination process, non-qualifying loan characteristics, and early payment defaults, are often rampant in pools of recent vintage sub-prime and Alt-A loans. The question is, are investors more likely to recoup their investments by suing the lenders to force repurchase (many of whom are now bankrupt or under FDIC conservatorship), or by working with servicers to keep borrowers in homes? The best answer is probably a combination of both. This entry was posted in Alt-A, Attorneys General, Aurora Loan Servicing, banks, BofA, Countrywide, investors, lawsuits, Lehman Brothers, lenders, repurchase, underwriting practices. Bookmark the permalink.